Little Water for mixing the flour with peanuts. 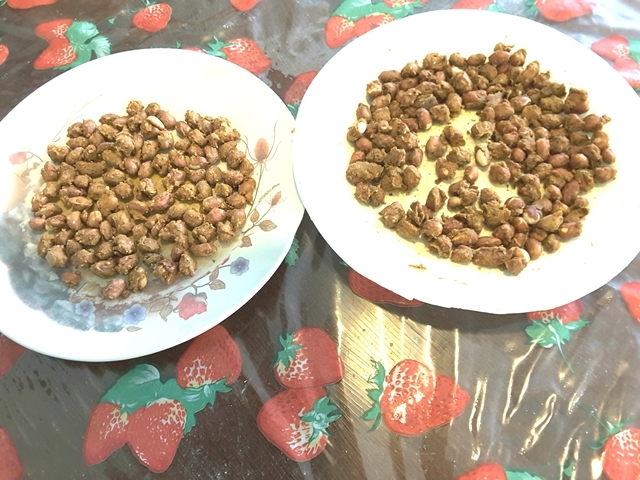 Drop the groundnuts in a bowl of water and immediately remove and drain. In a dry bowl, add and mix all the ingredients except oil and peanuts. Now add the peanuts and mix. Add water little by little and keep mixing. The peanuts should be coated with the batter. This should be dry not watery. Place the peanuts in a microwavable tray or dish or plate. The peanuts should be separated from one another. You can make in batches. I am doing this here in two batches –one without oil and one with oil. Microwave on high setting for 3 minutes. Remove mix and again microwave for another minute. Remove and allow to cool. If you want to add oil, do this after the peanuts are coated with flour mixture and then mix well. Then place them on the microwavable plate and microwave. Enjoy. Snack for all occasions. Remember Spice to taste.